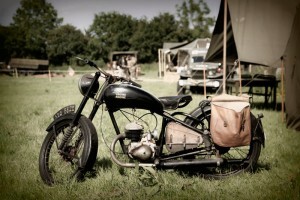 Historic reconstruction of military camp with American, German and civilian vehicles. Bar in a 1944’s grocery store. American Tank tours and display on combat techniques. Public opening: from 9 a.m.: Camp’s life, exhibition and vehicles parade. 9 p.m.: 1940’s danse “Stage Door Canteen” is an authentic recreation of the wartime service men’s entertainment center, with the best 1940s music. Evening Dress code wished. Mike & Deborah and their Doughnut Dollies will untertain you with 1940’s music! 9 p.m.: Concert USO CAMP SHOW with “Blue Tears Trio”, back in the 1950’s! USO was entertainment and live performances for GI’s “home away from home”. 3 p.m.: Friendly Baseball match between camp participants – women vs men. “Histoire et Collections” proposes books and brochures on the Battle of Normandy, 20th Century History and military vehicles. with diorama and displays, on the church square. Late evening on Saturday until midnight. Between 11 p.m. and 11:30 p.m.: Animations about pathfinders, night re-enactment with equipment and weapons. 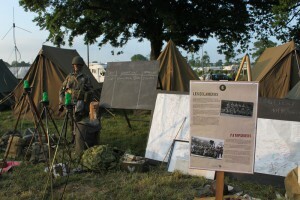 10 a.m.-6 p.m.: In the battery site, re-enactment « CRISBECQ ATTACK » everyday at 2 p.m. and 5 p.m.